As the first dedicated Front-End Developer, you’ll need to have a wide portfolio of skills and have experience in tackling new challenges. We’re looking for those whose passion is problem-solving and have a flair for learning new technologies quickly. The business has created a revolutionary new product for their niche and as they grow significantly outside of the UK, demand has now significantly overtaken capacity. As the organisation continues to develop, so does the need for their product portfolio to diversify, hence the need for several additional developers in the teams. What do you definitely need? 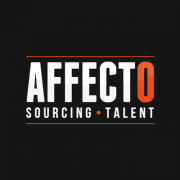 Affecto Recruitment Ltd is an IT Recruitment Consultancy and specialises in Software Engineers, Android and iOS Developers, Infrastructure Engineers, Test Analysts, Project Managers, Business Analysts, Database Administrators, Data Analysts, MI Analysts, BI Analysts and Embedded Software Engineers with a vast range of clients UK wide but predominantly South Yorkshire, West Yorkshire, East Yorkshire and Nottinghamshire.